Microsoft Corporation certified me as an Innovative Educator Expert in 2015. I won The Best Teacher award in 2011, at digital class competition . 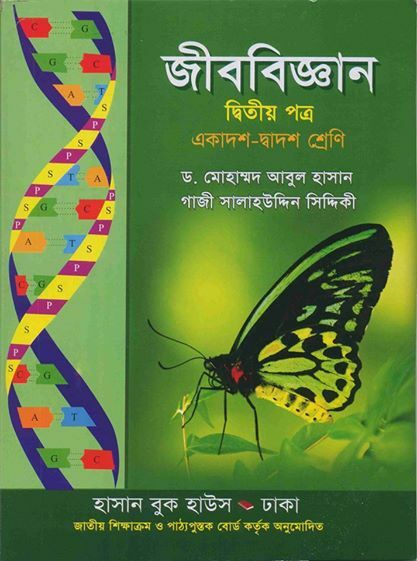 I am a writer of Biology Book for class 12. Which is approved by NCTB (National Curriculum and Text Book Board of Bangladesh). 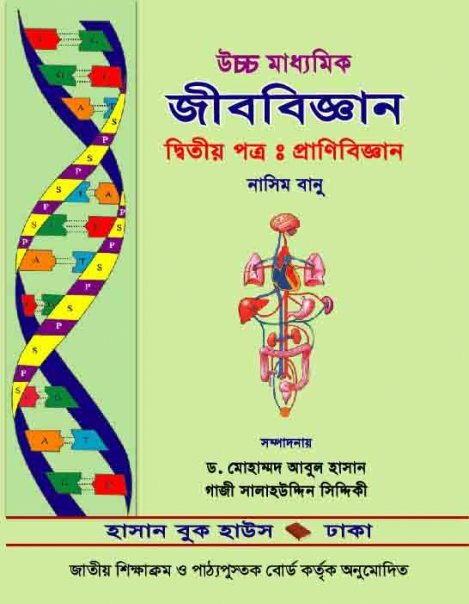 I Edited Higher Secondary Biology Book (written by Professor Nasim Banu), for class XI– XII Approved by NCTB (National Curriculum and Text Book Board of Bangladesh) Dhaka since 2001 to 2012. I have established an educational web site ( www.educatorbd.com) for Bangladeshi students. Here I add educational video clips. I have established a youtube educational channel (youtube.com/biologybd) which have 115,805 viewers and 120 subscriber. From this channel Lots of teachers and students dowonload video clips for education purpose. UNDP and Bangladesh government made a documentary film of digital class, using my activities in the class. At the UNDP website comment about my classroom and the achievement of Digital Bangladesh. 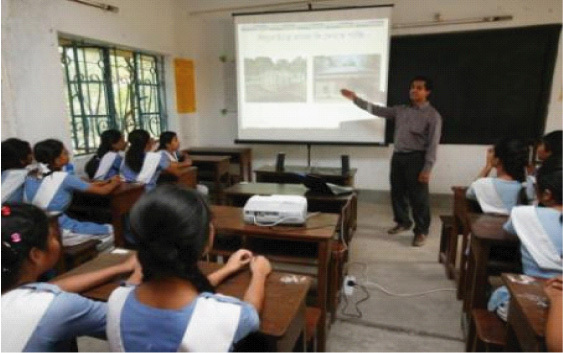 In the capital, Dhaka, five multimedia classrooms and a computer laboratory with 25 computers have been installed in Agroni School and College giving students an opportunity to learn from computer-generated tables, graphics and maps. I attend several TV talk show about digital education of Bangladesh at different channel. 1. The Daily Star (Star Campus), The leading News Paper of Bangladesh published my thinking about education of Bangladesh. 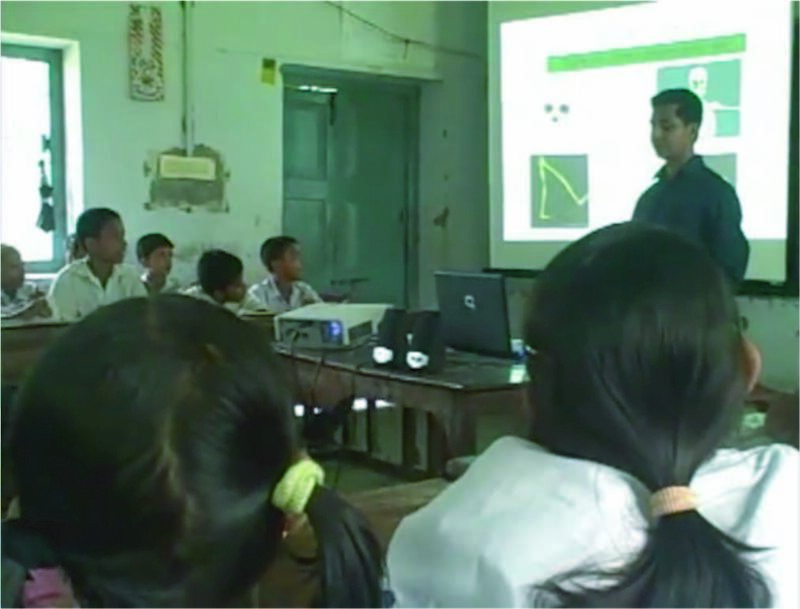 ….While visiting the multimedia classrooms of capital’s Agrani School and College last week it was found that nearly 50 students of class eleven looked curious in a Zoology class as they awaited lesson through a visual projection of their topic – ‘excretory system of human body’. Zoology teacher Gazi Salahuddin entered the classroom at 10 am to take his class on the said topic. He put his finger on the keyboard of a laptop to display visual pictures on the screen of the electronic projector in support of his lecture on the topic. As the visual pictures of a car and clean city appears on the screen during display of the digital contents teacher Salahuddin wanted to know from the students about pictures. …..এই প্রতিষ্ঠানে মাল্টিমিডিয়া ক্লাসরুম তৈরির প্রচেষ্টা একজন শিক্ষকের উদ্যোগেই এতদূর গেছে। শিক্ষা জীবনে অনার্স ও মাস্টার্স পর্যায়ে প্রথম শ্রেণিতে প্রথম স্থান অধিকার করা এই শিক্ষকের নাম গাজী সালাহউদ্দিন সিদ্দিকী। তিনি নিজেই এখন অনেক শিক্ষককে এ ব্যাপারে প্রাথমিক প্রশিক্ষণ দিয়ে আগ্রহী করে তুলছেন। প্রতিদিন নতুন আঙ্গিকে ‘ডিজিটাল কনটেন্ট’ তৈরির জন্য পরিশ্রম করছেন। ……. Performance of academic duties, courses covered, and teaching hours spent. 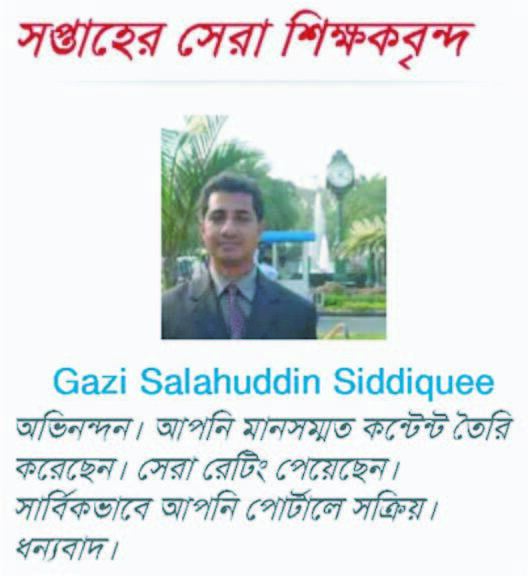 I, Gazi Salahuddin Siddiquee is a full time teacher at Agrani School and College. I am working here for a long time (1996). In my long 18 years experience I am always do my best and always sincere to my duties. I am always accept the new things and try to developed my teaching style, for this reason I always follow the modern technology. That is why I make my classroom, a multimedia classroom by using multimedia projector through my own content. At the leisure time I make PowerPoint presentation for the students. In spite of taking the classes I am also involved in exam committee where I make the questions and perform several duties. 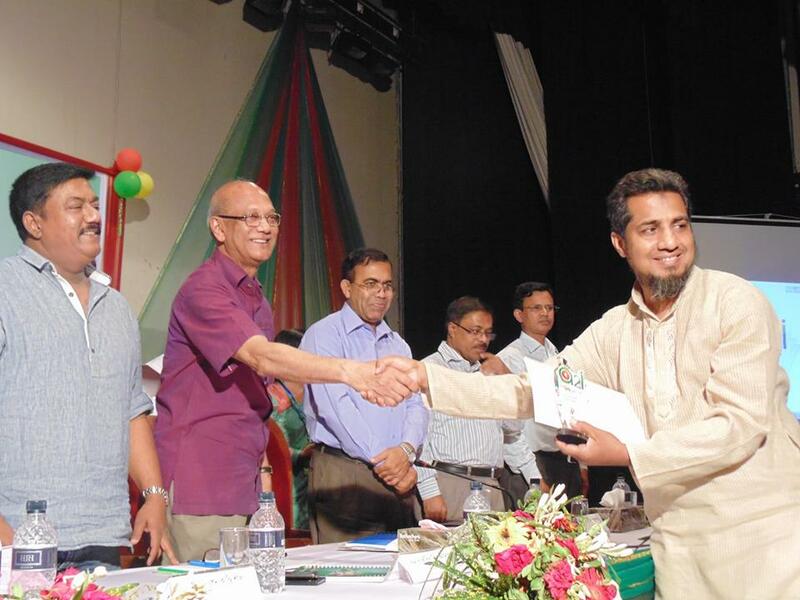 For a long time am a honorable examiner of Dhaka education board. Recipient of awards relevant to teaching profession. Academic publications (books, scientific or popular articles in any field of Zoology). (i) I published abstract on heavy metal toxicity in the Journal of Zoological Society of Bangladesh in 2001. (ii) I wrote on educational articles at several magazine and news paper. (a) কেমন হবে একুশ শতকের শিক্ষা? (i) I usually work as a resource person for digital Educational contents making at Access to Information (A2I) Program, Prime Minister`s Office, Government of the People`s Republic of Bangladesh. (ii) I have enough contribution on National Encyclopedia to make digital content. (iii) I am working with UNDP to digitalize Bangladeshi education system. Involvement in any developmental work to improve the class room activities. (ii) I have enough contribution to establish multimedia classroom in Bangladesh. Others (extracurricular activities, recipient of award in any social work. 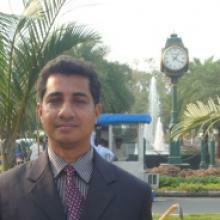 I am a member of iEARN-BD since 2004 (International Education and Resource Network, Bangladesh) . Involvement with on campus or off campus nature club. (i) I am a life member of Notre Dame Nature study club, Notre Dame College, Dhaka. which works to conserve environment. Membership of the Zoological Society of Bangladesh. I am a life member of Zoological Society of Bangladesh. (ZSB Life member no 402). Membership of other Zoology related scientific/ professional societies. I am proud to be a life member of Notre Dame Nature Study Club. Notre Dame College, Dhaka. Participation in scientific excursion/ field trip. 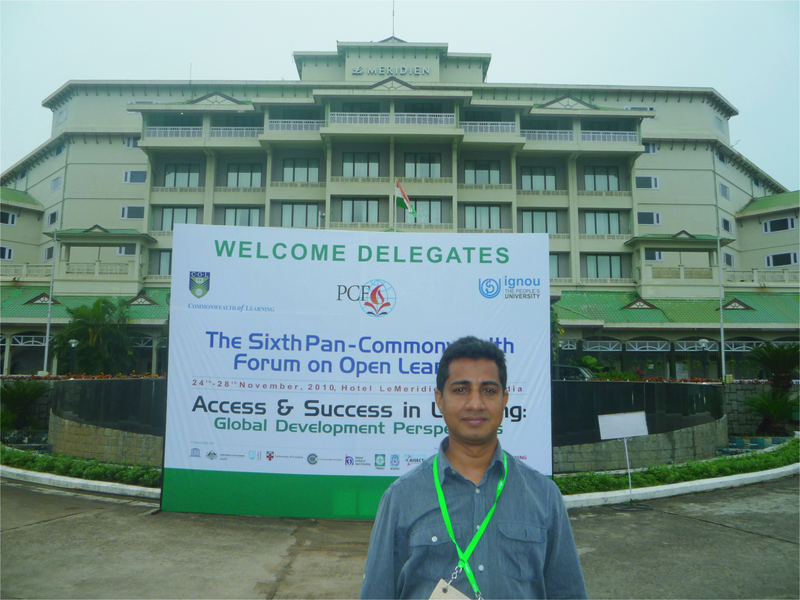 (i) I attended in 6th Pan pacific Common wealth open and distance learning conference held in Kerala, India on November, 2010. I have learned lots of things from there. (ii) I am trying to attend all scientific seminars and symposium. Its my passion. Participation in seminar, workshop, annual meeting of ZSB. (ii) I attend the Training and Research in Tropical Aquaculture, organized by Department of Zoology, University of Dhaka and Institute of fisheries and Marine Biology University of Bergen, Norway in 1998. (iii) I completed Course on Experimental Design Jointly conducted by the department of Zoology University of Dhaka, Bangladesh and the department of Zoology University of Bergen, Bergen, Norway in 1998. (iv) I gladly attended training workshop of ‘’Four Rivers, One World’’ Project Teacher Training Workshop in Dhaka in 2007, Organized by iEARN-BD, International Education and Resource Network. (v) I attended Introduction of ICT in Educational Institutions in Collaboration with iEARN Workshop, Dhaka, Bangladesh in 2010.